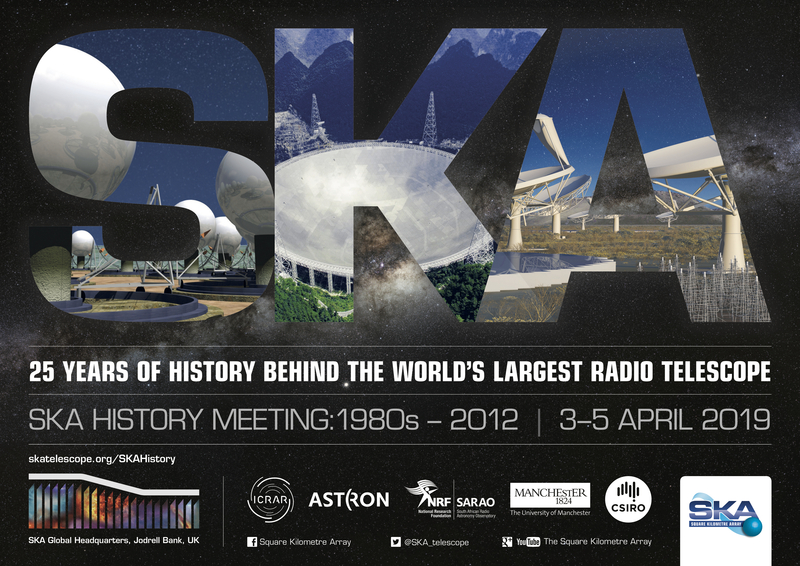 The meeting on the History of the SKA from the 1980s to 2012 will be held from 3 to 5 April 2019 at the SKA Organisation Global Headquarters at Jodrell Bank, UK. The 1980s-2012 period covers the time from early ideas about a large radio telescope up to the SKA site decision made by the newly established SKA Organisation. This period of SKA history is the subject of a book in preparation by the undersigned. Discussions, taking up about a third of the meeting, on topics that range over the various themes, and also reflect on the SKA as a mega-science project. There will be short introductions to the discussion topics. We expect the discussion periods will provide participants with an opportunity to contribute to the meeting in an informal way that encourages cross-fertilisation of ideas and insights about the history of the SKA, and increases our collective understanding of the development of the SKA and mega-science projects in general. Payment of the registration fee can be done by bank transfer or credit card (see ” conference payment” tab) Invoices for the fee can be issued by the SKA Organisation on request to the LOC (skahistory2019@skatelescope.org). An email receipt will be issued after payment has been received. The block booking at a special rate for meeting participents at Cranage Hall near Jodrell Bank (see "venue and accommodation" tab) is no longer available since the deadline has now passed. Bus transport for participants to SKAO Global Headquarters for the meeting will depart from and return to Cranage Hall on a daily schedule throughout the conference. The Conference Dinner will be held on the evening of 4 April at Cranage Hall; the cost of the dinner is included in the registration fee. The conference dinner speaker will be Professor Sir Tejinder Singh Virdee FRS, from Imperial College London. Accompanying guests are welcome at the dinner which will cost £35 per person. This can be paid at the time of registration. We look forward to seeing you here at Jodrell Bank in April!